This recording was made during the construction of an underground tunnel in the national road connecting Athens with Thessaloniki. It was used as a sound installation at the tunnel construction company’s planning offices, showing the different working environments that exist for the construction of a tunnel. As a field recording it shows the degraded importance of the sonic environment compared to that of the visual. Das feine CDR Label aus Griechenland veröffentlicht nicht nur aber doch vorwiegend heimische Projekte in kleinen Auflagen. Zwei Beispiele für die Vielfalt des griechischen Undergrounds, der hier kaum wahrgenommen wird, sind die hier vorliegenden CDRs. Jeweils ausgehend von einer einfachen Konzeptidee sind dies zwei grund-sympathische Beispiele für das Verfolgen und das Ausformulieren klanglicher Gestaltung entlang eines Impulses von außen; aus der echten Welt quasi. Der Vorwurf, es handele sich um seelenloses Abstraktgefrickel, kann hier ganz sicher nicht aufkommen. Adam_is (Michail Adamis) fängt in relativ rohen Feldaufnahmen Tunnelbauarbeiten ein; spiegelt die Luftverhältnisse in den Räumen wider und läßt dumpfe grollende Schläge im Nichts verhallen. Das erstaunliche aber ist, dass die Arbeit trotz der Big Sounds kein bisschen pathetisch oder überladen klingt! as11, eher für kaum hörbare Zischeleien bekannt bisher, vermengt hier abstrakte Prerecordings mit liveelektronischen Elementen und begeht so einen Tanz vor dem Spiegel der eigenen persona musica. Beides echte kleine feine Entdeckungen! Michail Adamis recorded these sounds during the construction of an underground tunnel in the national road linking Athens and Thessaloniki, the result used as a sonic installation at the planning offices of the involved company. The aim was to highlight the different aspects of the working environments in the realization of the project. On a purely phenomenal basis, this is a potent mass of rumbles, shrieking frequencies, long reverberations and violent thuds. The whooshing presence of the vehicles and the almost scary creaks and chugs bring recollections from the late eighties – post industrial a go-go in my house and head. Some of the sections were certainly looped, attributing a semi-entrancing quality to something that, on the contrary, usually causes a constant shattering of nerves. At times one hears voices drowned in the clanging hubbub. Is that an impression only? I don’t know. A fairly acceptable example of environmental recording, no pretence and not really “art”, with several surprising escalations. Perfect for looking at people’s mouth moving without hearing what they’re saying. The noise from a tunnel is more interesting anyway. Μεταποιώντας ως Adam_Is field recordings από εργασίες σε υπόγειο τούνελ (οι κλειστοφοβικοί ας αποχωρήσουν…), παραδόξως (;) ο Μιχάλης Αδάμης απηχεί στο “Moles” το φυσικό -πλέον- περιβάλλον μας όταν σιωπά η μουσική. Ανεξάρτητη εταιρία από την Αθήνα με ενδιαφέρουσες παρραγωγές, όλες από το χώρο της underrground avant σκηνής, η echomusic έχει φτιάξει ένα μικρό αλλά συμπαγή κατάλογο από electro, concete, drone και environmental ηχογραφήσεις, τυπωμένες σε καλοφτιαγμένα CD-R και βεβαίως, σε μικροποσότητες. Σε 99 αντίτυπα, τον περασμένο Μάρτιο κυκλοφόρησε το “Moles” του Adam_is (άλλως Michail Adamis), μια field recording πραγματοποιημένη σ’ένα υπό κατασκευή τούνελ, στην εθνική Αθηνών-Θεσσαλονίκης. Μέσα σε 50 λεπτά, ο καταγραφέας επιδιώκει να παρουσιάσει πέντε διαφορετικές φάσεις από την πορεία του έργου, προσφέροντας ένα τεχνητό/περιβαλλοντικό soundtrack, ικανό να διαλύσει για πάντα τον… ύπνο του ΥΠΕΧΩΔΕ. 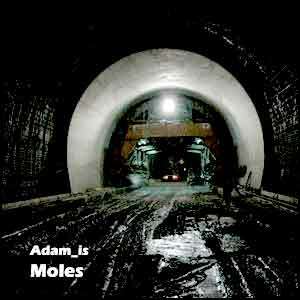 Moles is the first audio fruit of sound artist Adam_is aka Michail Adamis, it offers up five road/tunnel making sound based tracks that go from echoched purring, to machine idleing drones, to often quite complex tapestry of different drill and machine tones. All the sounds here were sourced during the construction of an underground road tunnel that connects Athens with Thessaloniki. Then the sounds have been manipulated to an extent, though it’s offten unclear how much the sound has been altered or moved about to compose the five audio selections. Which I think shows real talent it it’s self, as your unshaw how much of the sound work is luck or chance or placed there. Clearly there are moments like the middle of track three, which have been constructed – as a wonderful rhythmic chopping sequenced of sound is locked into an odd work man like whistling, with other drilling and boring sounds cleverly added in around – really this is true industrial music. But like all of the other tracks, it then seamlessly drifts back into less composed elements. The other clever thing he does is move in a composed element underneath a flowing and real time element, which again blurs the bounders. An interesting investigation into a state between composed and non-composed source materials. That unlike a lot of environmental sound/sound art does manage to keep one’s attention though out with it’s varied and shifting textures. To find out more dig here (http://www.echomusic.gr). The city is a noisy place – we know. Cars, metro, people – they all make a sound. About a century ago, Luigi Russolo thought of the city noise as music and since the invention of the tape-recorder it has become music, starting with the train sounds of Pierre Schaeffer. Michail Adamis is a new kid on my block, but he’s well known enough to be invited by the company which is building ‘an underground tunnel in the national road connecting Athens to Thessaloniki”. In their offices Adamis made an installation using field recordings made during the construction. As far as I can tell it doesn’t use any sort of electronic processing, but that is not necessary: the electronics used in making the tunnel gives already enough electrical charges and subtle changes that it’s already an interesting release. Five lengthy pieces of environmental noise. Elevators, drilling sounds and cars passing. It may sound like it was all recorded in one go, but there is a piece of ‘score’ enclosed which suggest the contrary, and that makes it all the more curious. It all makes a pretty decent, not really surprising release.